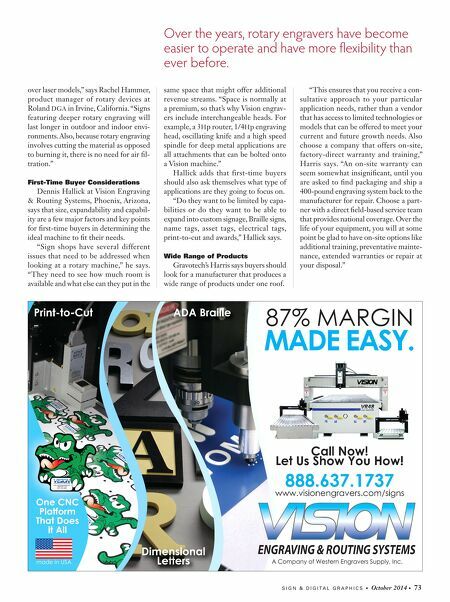 S I G N & D I G I T A L G R A P H I C S • October 2014 • 73 over laser models," says Rachel Hammer, product manager of rotary devices at Roland DGA in Irvine, California. "Signs featuring deeper rotary engraving will last longer in outdoor and indoor envi- ronments. Also, because rotary engraving involves cutting the material as opposed to burning it, there is no need for air fil- tration." 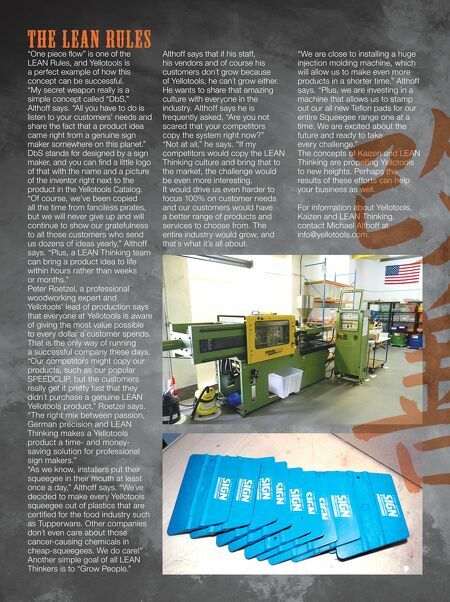 First-Time Buyer Considerations Dennis Hallick at Vision Engraving & Routing Systems, Phoenix, Arizona, says that size, expandability and capabil- ity are a few major factors and key points for first-time buyers in determining the ideal machine to fit their needs. "Sign shops have several different issues that need to be addressed when looking at a rotary machine," he says. "They need to see how much room is available and what else can they put in the same space that might offer additional revenue streams. "Space is normally at a premium, so that's why Vision engrav- ers include interchangeable heads. For example, a 3 Hp router, 1/4Hp engraving head, oscillating knife and a high speed spindle for deep metal applications are all attachments that can be bolted onto a Vision machine." Hallick adds that first-time buyers should also ask themselves what type of applications are they going to focus on. "Do they want to be limited by capa- bilities or do they want to be able to expand into custom signage, Braille signs, name tags, asset tags, electrical tags, print-to-cut and awards," Hallick says. Wide Range of Products Gravotech's Harris says buyers should look for a manufacturer that produces a wide range of products under one roof. "This ensures that you receive a con- sultative approach to your particular application needs, rather than a vendor that has access to limited technologies or models that can be offered to meet your current and future growth needs. Also choose a company that offers on-site, factory-direct warranty and training," Harris says. "An on-site warranty can seem somewhat insignificant, until you are asked to find packaging and ship a 400-pound engraving system back to the manufacturer for repair. Choose a part- ner with a direct field-based service team that provides national coverage. Over the life of your equipment, you will at some point be glad to have on-site options like additional training, preventative mainte- nance, extended warranties or repair at your disposal." Over the years, rotary engravers have become easier to operate and have more flexibility than ever before. made in USA A Company of Western Engravers Supply, Inc.